Last week I was invited by Nuffnang to join the premiere screening of Journey to The West and unfortunately, I was assigned by my boss to fly to Sabah for work on that day itself. I have to skip the movie at the very last minute. So sad! 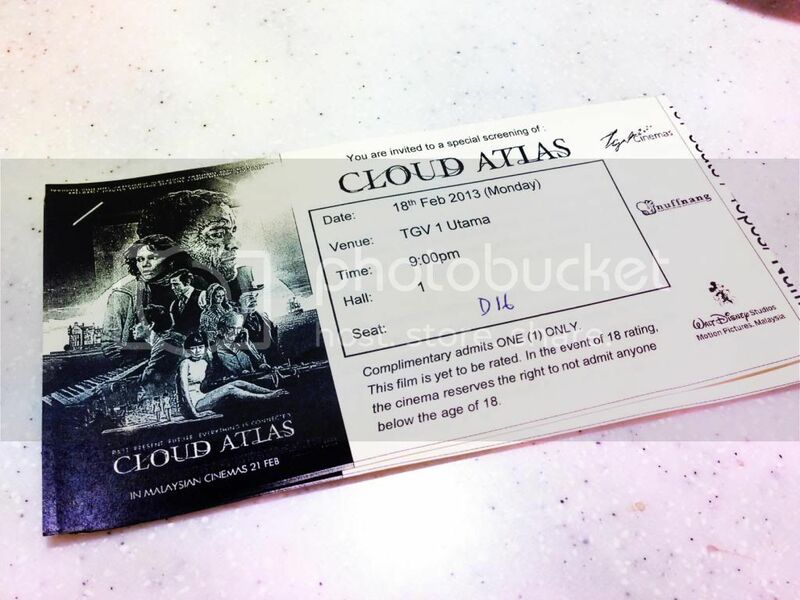 T.T Anyway, this week I wanna thank Nuffnang again for giving me the opportunity to watch the Cloud Atlas! This film is about an exploration of how the actions of individual lives impact one another in the past, present and future, as one soul is shaped from a killer into a hero and an act of kindness ripples across the centuries to inspire the revolution. The film consists of six interrelated and interwoven stories that take the viewer from the South Pacific in the 19th century to a distant, post-apocalyptic future. This movie has very complicated storyline and I find it interesting in my opinion. Anyway, this movie takes about 3 hours and I guess it is worth watching as it reveals how the actions and consequences of individual lives impact one another throughout the past, present and future. Rate of the movie: 3.5/5.